A real engineering job! You can make a model of a mobile crane with Meccano, or a bridge, or a truck. The best of it is they really work! You're the engineer - and the inventor. Ask for a Meccano Outfit next birthday. Meccano, more than a toy. I was introduced to Meccano at the age of five by my father, who bought me a huge outfit and showed me what it was for by building a superb model helicopter. He then helped me to build some simple models from the beginning of the thick instructions manual. The helicopter he made served as an inspiration, but to my dismay I could not match it with my own limited skills. This put me off me from trying, and eventually the Meccano was given away to a local youth club. A few years later a brand new but smaller Meccano set found its way into my Christmas stocking. This was much better suited to my age and abilities, and in no time I found myself building a series of small but attractive models. Encouraged by this success, I added to my stock of parts, building ever bigger and more complex creations. I had found a truly absorbing hobby, which I still follow today at the age of 60+. 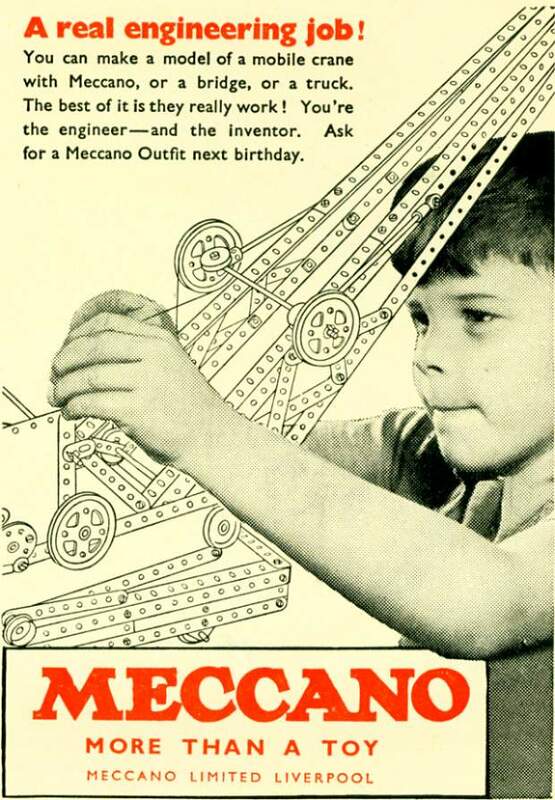 As the advertisement stated, Meccano is "more than a toy", and it certainly proved to be so in my case.